VMware has a great facility for taking a snapshot of a VM and creating multiple clones. Each cloned VM is independent but all inherit from the same base installation. VirtualBox also allows cloning, although it’s less sophisticated. Virtual PC offers a facility called hard disk “differencing,” that allows you to create any number of VMs from an existing hard disk image. Unfortunately, any changes to the original disk image will corrupt all inheriting VMs. However, we can use differencing to create two new VMs from our XP Mode disk image. One VM will be used for IE6 and the other will be used for IE7. First, create a new virtual machine. 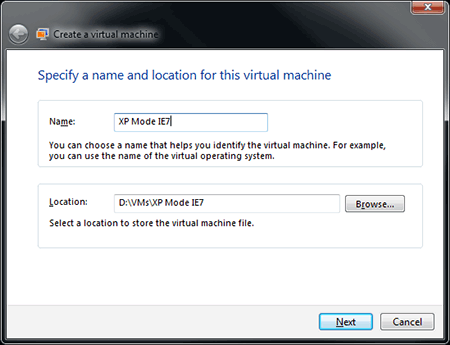 Start Virtual PC from Start > Programs > Windows Virtual PC > Virtual Machines then click Create virtual machine on the toolbar to reveal the dialog box shown in Figure 4, “VM Name and Location”. Enter the name and location of your new VM, then click Next. The next screen asks how much RAM your VM requires. 256MB should be enough for just running IE; enter the amount and click Next. 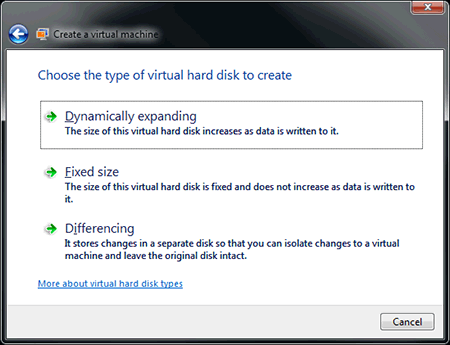 The next screen, shown in Figure 5, “Configuring your VM hard disk”, asks you to add a virtual hard disk. 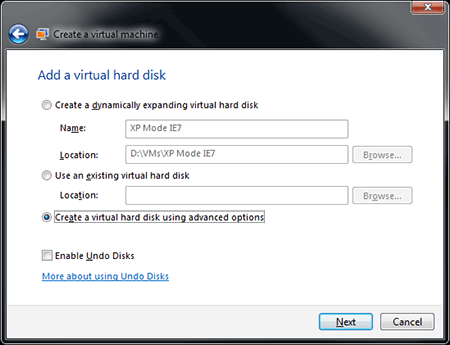 Choose Create a virtual hard disk using advanced options and click Next. Then choose the Differencing option from the choices shown in Figure 6, “Choose Differencing”. Click Next twice, then select your original XP Mode hard disk. This is a file named Windows XP Mode.vhd and is located where you originally installed XP Mode. Finally, click Create to save the VM and return to the Virtual Machines dialog. Before starting your new VM, right-click its icon and choose Settings to change any of the parameters that are specific to your PC or setup. Your new VM is now ready, but remember that you should create two: one for IE6 and one for IE7. Repeat the four steps above as necessary. Once your two VMs have been created, I’d recommend making the XP Mode hard disk file read-only (Windows XP Mode.vhd). That should ensure the file is protected from modifications if you accidentally boot your original XP Mode image. Start your IE6 Virtual Machine by double-clicking its icon in the Virtual Machines folder (Start > All Programs > Windows Virtual PC > Virtual Machines). 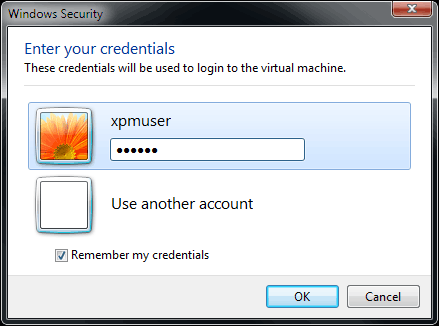 You’ll need to log on with the XPMUser ID and password you entered when installing XP Mode (I did say you would need to remember it!). You can now make any relevant configuration changes to XP and IE6. For example, developers should install the Microsoft Internet Explorer Developer Toolbar—it’s no Firebug, but it’s better than nothing. Next we need to copy the IE shortcut. Right-click the XP Start button and select Explore All Users. Any shortcut you copy into this folder will be replicated in the Windows 7 Start menu. Therefore, create or copy an IE shortcut as necessary, like I’ve done in Figure 7, “Creating an IE6 shortcut”. After a few moments, a new folder containing the IE6 icon will appear in the Windows Virtual PC Start menu. From the XP Start menu, choose Log Off. Close the window, but choose Hibernate from the drop-down list. To start IE6 from Windows 7 click Start > Programs > Windows Virtual PC, then locate the newly created VM folder, and click the IE icon. The first time IE is run, you will be prompted for the XPMUser password, as shown in Figure 8, “XPMUser password prompt”—enter it, tick Remember my credentials, and click OK. Assuming you keep your VM hibernated, IE6 will start within a few seconds every time you click its icon. in step 2, download and install IE7. 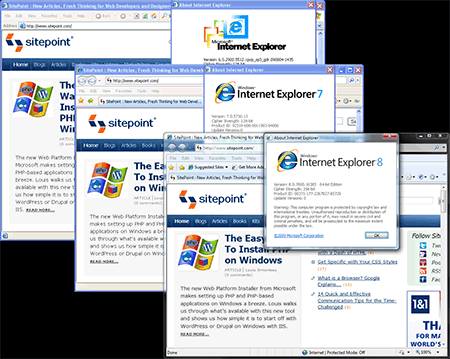 You can now run IE6 (from one VM disk), IE7 (from the other VM disk), and IE8 (as a native application) from the same Windows 7 desktop; the proof is in Figure 9, “IE6, IE7, and IE8 all together on one desktop”. Has anyone noticed how much simpler and nicer IE6’s interface is? Sshhh—don’t tell anyone! Are You Considering a Windows 7 Upgrade? XP Mode is the only reason I bought Windows 7 Professional. For web developers, it removes the barrier to regular IE testing, saves countless hours of waiting for VMs to start, and allows you to spot rendering problems early. It’s impressive and certainly makes the extra cost worthwhile. However, be careful to choose the right version. Will you try XP Mode? Will it reduce your web development and testing time? Leave your comments to let me know how you go.